Considered one of the best hubs in the region, the cost of living in Bahrain is relatively affordable. For expatriates and locals alike, the Kingdom of Bahrain provides a safe, secure, and easy life. Moreover, while imported food items and household goods may be expensive, there are always cheaper local alternatives that are of excellent quality. In Bahrain, utilities such as electricity, water, and gas are subsidized by the government. This means that as a resident, you will benefit from inexpensive access to these services. Bahrain’s lack of taxation laws also provide residents with relatively cheap cars. On average, the cost of living in Bahrain is 20.34% lower than in the United States. Furthermore, rent in Bahrain is 20.61% lower than in the United States. Although the cost of living is increasing, it is still lower than in neighboring cities such as Dubai and Abu Dhabi. The 2016 Mercer Cost of Living Survey ranked the capital city of Manama 71st out of 209 cities. While the cost of living in Bahrain will vary widely based on your lifestyle, this rough estimate of prices will give you better insight into how much you can expect to spend each month. Whether you choose to buy or rent an apartment, this will probably take up the largest bulk of your salary. Property prices in Bahrain range widely, depending on the area and size of the unit. Of course, any property within an expat compound will be more expensive than one further away from the city center. You can find here more details about what factors to consider when renting in Bahrain. 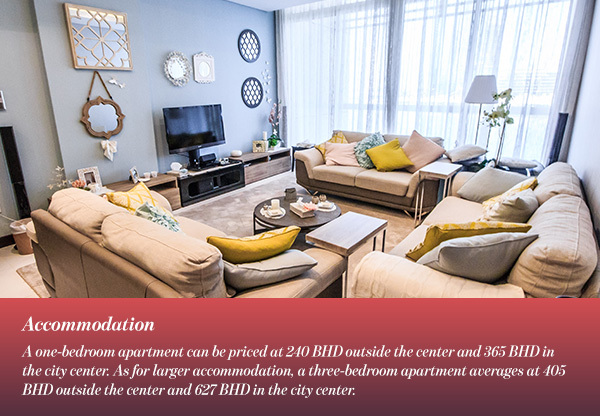 The rental of a one-bedroom apartment can be priced at 240 BHD outside the center and 365 BHD in the city center. As for larger accommodation, a three-bedroom apartment’s rental averages at 405 BHD outside the center and 627 BHD in the city center. Moreover, the average price per meter for an apartment outside the center is 472 BHD, while the average price per meter in the city center is approximately 743 BHD. Utilities can start at about 39 BHD per month for one person in a studio apartment. You can also expect to pay 11 BHD per month for Internet (8 Mbps). So if you happen to be living on your own in Bahrain, you would need a minimum of 290 BHD per month for accommodation alone. Of course, eating at home is a much cheaper alternative than dining out. However, if you choose to do so, expect to pay 2 BHD for a meal at an inexpensive restaurant and 7 BHD at a mid-range restaurant. At the market, the cost of grocery shopping will depend highly on your preferences and diet. For instance, a liter of milk will cost about 0.61 BHD while a loaf of bread averages 0.43 BHD. 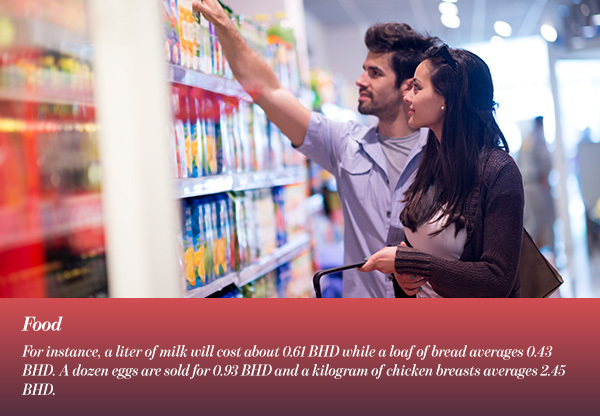 A dozen eggs are sold for 0.93 BHD and a kilogram of chicken breasts averages 2.45 BHD. Furthermore, a kilogram of vegetables ranges from 0.39 BHD to 0.42 BHD. A kilogram of fruit lies within a slightly higher range, averaging 0.78 BHD to 0.86 BHD. While this also depends on your habits, you may expect to pay about 40-50 BHD per month on groceries for one person. 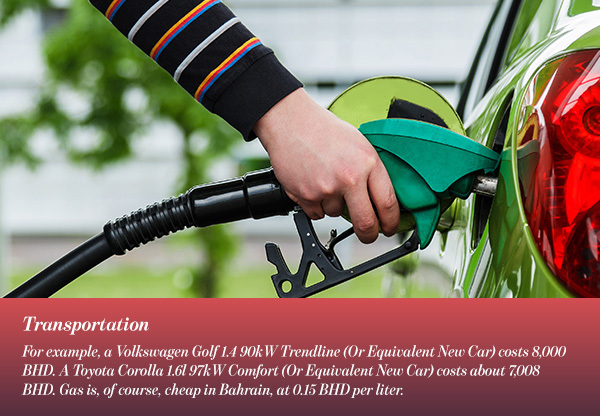 What you choose as your mode of transportation will have a great effect on the cost of living in Bahrain. If you opt to buy a car, you will be happy to know that there are no taxes on cars in the Kingdom of Bahrain. This makes them much more affordable than in other countries. For example, a Volkswagen Golf 1.4 90kW Trendline (Or Equivalent New Car) costs 8,000 BHD. A Toyota Corolla 1.6l 97kW Comfort (Or Equivalent New Car) costs about 7,008 BHD. Gas is, of course, cheap in Bahrain, at 0.15 BHD per liter. As for public transportation, a one-way ticket costs 0.3 BHD while a monthly pass is sold for 14 BHD. Furthermore, as per normal tariff, a taxi starts at 2 BHD and charges 0.3 BHD per kilometer. While living in Bahrain, you will definitely be going out to enjoy its vibrant streets. There’s a lot to do in the kingdom, from visiting historic sites and museums to cinemas, theatres, and entertainment and dining venues. A ticket to the cinema is standard across Bahrain, at 3 BHD, while the best seats at the theatre cost 6 BHD. 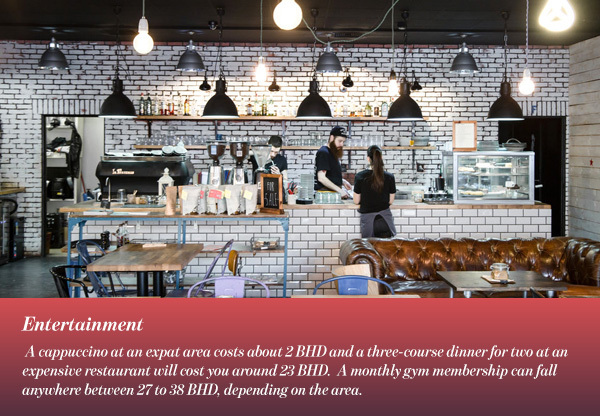 A cappuccino at an expat area costs about 2 BHD and a three-course dinner for two at an expensive restaurant will cost you around 23 BHD. A monthly gym membership can fall anywhere between 27 to 38 BHD, depending on the area. Designer clothes and international brands in Bahrain are not cheap. However, bear in mind that you will not be spending much on winter clothes due to the weather. A pair of branded jeans may be a little over 17 BHD while a summer dress at a chain store costs around 18 BHD. 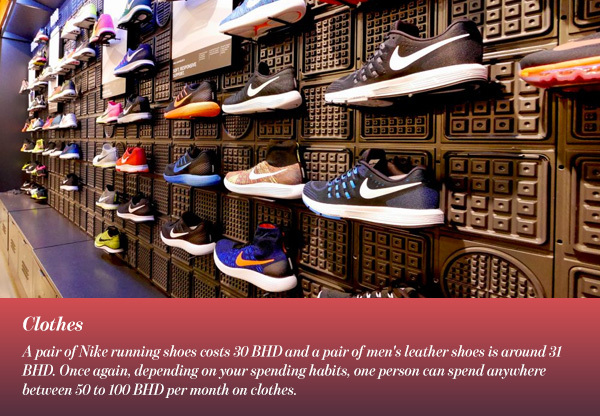 Furthermore, a pair of Nike running shoes costs 30 BHD and a pair of men’s leather shoes is around 31 BHD. Once again, depending on your spending habits, one person can spend anywhere between 50 to 100 BHD per month on clothes. While in Bahrain, a short visit to the doctor will cost you 15 BHD. 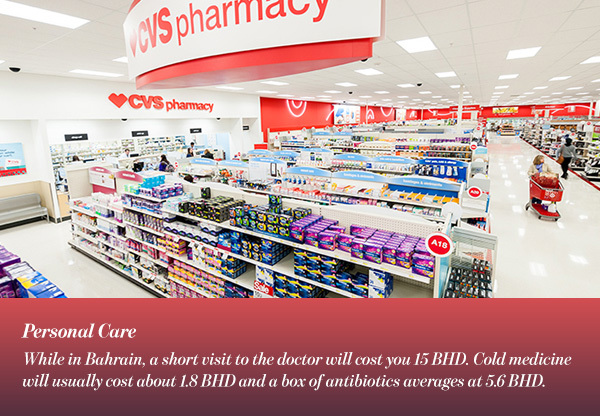 Cold medicine will usually cost about 1.8 BHD and a box of antibiotics averages at 5.6 BHD. However, it is worthy to mention that most expats receive health insurance as part of their work contract. Furthermore, toiletries such as 50 ml deodorant and 400 ml shampoo are both sold for approximately 1.6 BHD. A tube of toothpaste is 1.2 BHD and a men’s haircut at an expat area will set you back around 3.5 BHD. If you are traveling with your family, the cost of living in Bahrain will naturally increase. Although some expat contracts include children’s education, it is not always common. 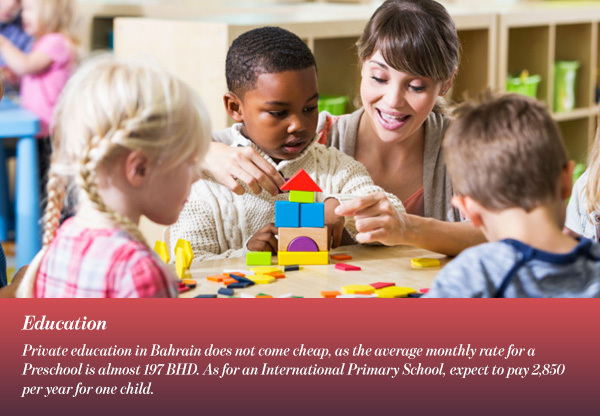 Private education in Bahrain does not come cheap, as the average monthly rate for a Preschool is almost 197 BHD. As for an International Primary School, expect to pay 2,850 per year for one child. As a single expatriate living in Bahrain, your lifestyle will play a large part in determining your expenses and savings. Moreover, your salary will help you decide how much you can spend on miscellaneous items. On average, most expats spend 32.7% of their monthly salary on rent, 31.2% on market expenses such as groceries, 12.1% on restaurants, 8.6% on sports and leisure, and 8.4% on transportation. Clothing and shoes and utilities take up the least sum out of the monthly salary. Although it will be hard to determine how much you will spend as an expatriate in Bahrain, you can make a rough estimate. Based on the previously listed figures, which are an average calculation taken from across the Kingdom, you will have a better understanding of the real cost of living in Bahrain.